Hello and welcome to my webpage about Lampsilis abrupta or more commonly known as the Pink Mucket! Feel free to check it out and learn more! 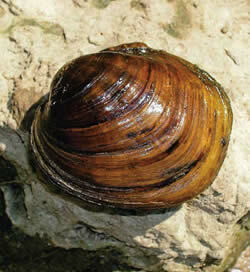 The Pink Mucket is a type of mussel that lives in fresh waters throughout many rivers of the country. The Pink Mucket is currently known to be an endangered species according to the Department of Natural Resources (DNR). The Pink Mucket has a rounded, thick , inflated, smooth, yellowish-brown shell. The shell can be rounded to slightly elongated depending on if it’s a male or female. The posterior end is bluntly pointed in males while females are shorter and nearly square. Adults are usually between three to five inches long. 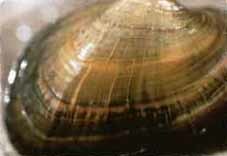 Faint green rays sometimes appear but are absent in adult shells. The shell’s inner lining (nacre) is a white to light salmon or pink color while it’s salmon to orange in the beak cavities.